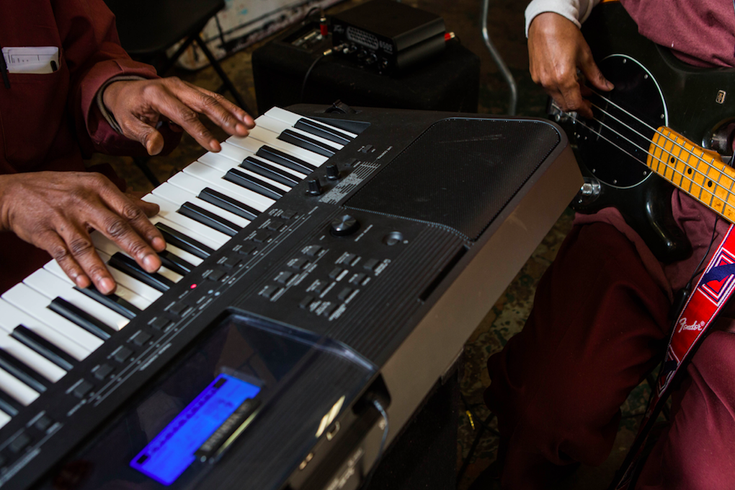 on Friday, “Rise Up: Songs and Stories from SCI-Graterford” will present the world premiere of nine songs written by the men during workshops inside the maximum-security prison performed by a live band of Philly-area musicians. Community arts activists August Tarrier and Miles Butler have been passing in and out of the foreboding walls at Graterford Prison for the better part of a year. This weekend, they’ll bring something out with them – the voices of 25 incarcerated men. 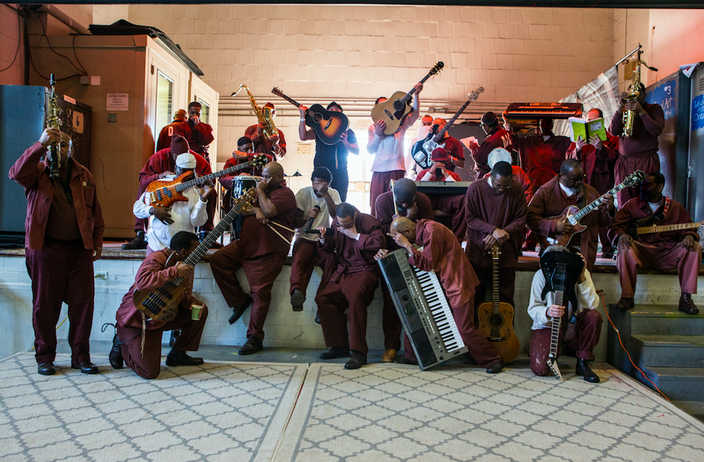 At the Painted Bride on Friday, “Rise Up: Songs and Stories from SCI-Graterford” will present the world premiere of nine songs written by the men during workshops inside the maximum-security prison performed by a live band of Philly-area musicians. Graterford had gone without a music program for more than a decade when Tarrier and Butler approached the state correctional institution with the idea for their new program, "Songs in the Key of Free." 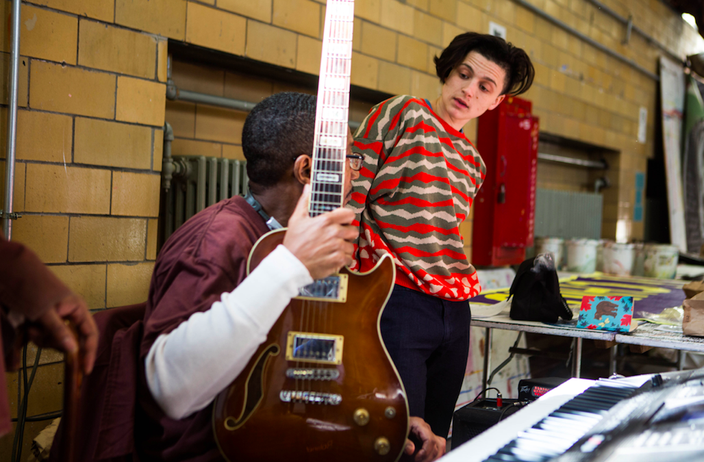 Beginning last October, the Germantown-based pair, along with recent Curtis Institute grad and composer Emily Cooley, began a series of weekly workshops in which the incarcerated men were helped to put their experiences into song. Since then, they’ve recorded an EP of those songs, performed them live within the walls of Graterford, and now will have their music heard by a wider audience on the outside. State prison rules don't allow inmates to show their faces or give names for photos. The songs that resulted from the program range from rock to hip-hop to country, and touch on a number of issues including mass incarceration, systemic racism, the Black Lives Matter movement and the school-to-prison pipeline. Butler, a singer/songwriter who grew up singing in Philly’s Commonwealth Youth Choirs, brought the lessons he’d learned from the folk tradition into the program with him. Aware that there will inevitably be opposing voices protesting their work with these inmates, the co-founders acknowledge the inmates’ crimes while still nurturing their humanity and attempting to illuminate injustices. For the inmates, the program offers not just a chance to express themselves but an opportunity for cooperation. For the inmates, the program offers not just a chance to express themselves, but an opportunity for cooperation. The men were divided into a series of songwriting and performing groups, and most of the songs were ultimately penned collaboratively. For the audience at the Painted Bride, the music will serve as a reminder of the humanity that’s been locked away, according to Cooley.